Our first look at Snowmass Lake. It started with this photo and a series of emails to the photographer, Ann Driggers. One look at the sparkling blue waters of Snowmass Lake and I knew I had to get there. 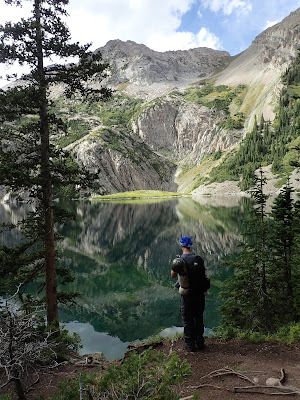 With three days and nights to play with on a trip to Colorado, my partner in crime and I researched itineraries that involved the lake, including the Four Pass Loop. We decided against the loop; backpacking 29 miles over four high altitude mountain passes in three days after coming from sea level was possible, but potentially not as much fun as taking our time to explore. Instead, we planned to hike in and camp at Snowmass Lake on the first day and use that as base camp. We'd climb Snowmass Mountain (14,005') on the second day, explore the area on the third day, then hike out on the fourth morning and drive three hours to Cedaredge for good friend Heather's wedding. Despite our best efforts to plan, we had to adjust due to unexpected events, as is often the case outdoors. We woke early at a friend's cozy condo in Winter Park after a full day of downhill mountain biking at Trestle Bike Park, which wasn't easy. 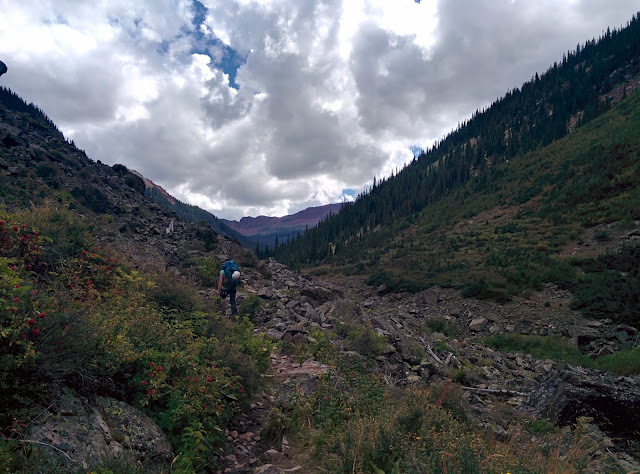 Our scenic driving route led us south and then west up over Independence Pass (which was amazing), through Leadville for delicious coffee, into Aspen for last minute supplies and advice, and eventually, to the Snowmass Creek Trailhead (39.199803, -107.003091). 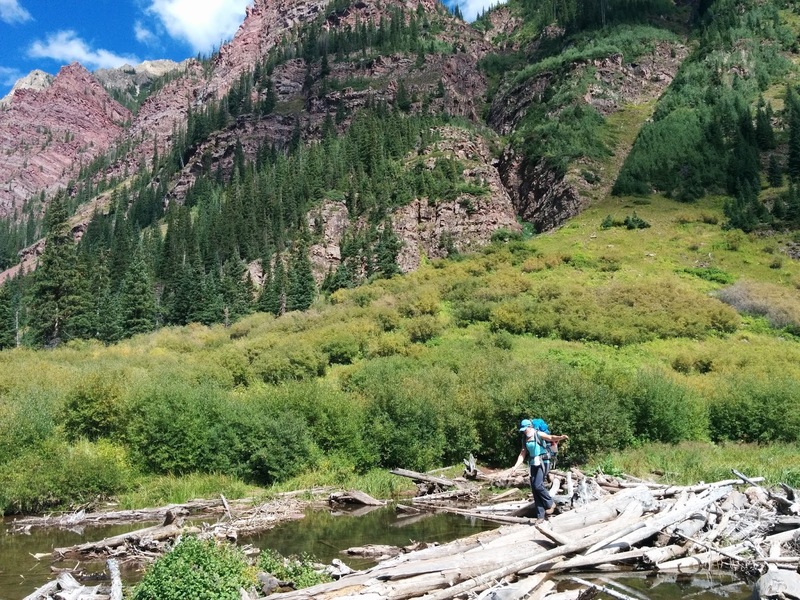 Snowmass Creek is one of the most heavily traveled areas of the Maroon Bells Snowmass Wilderness. 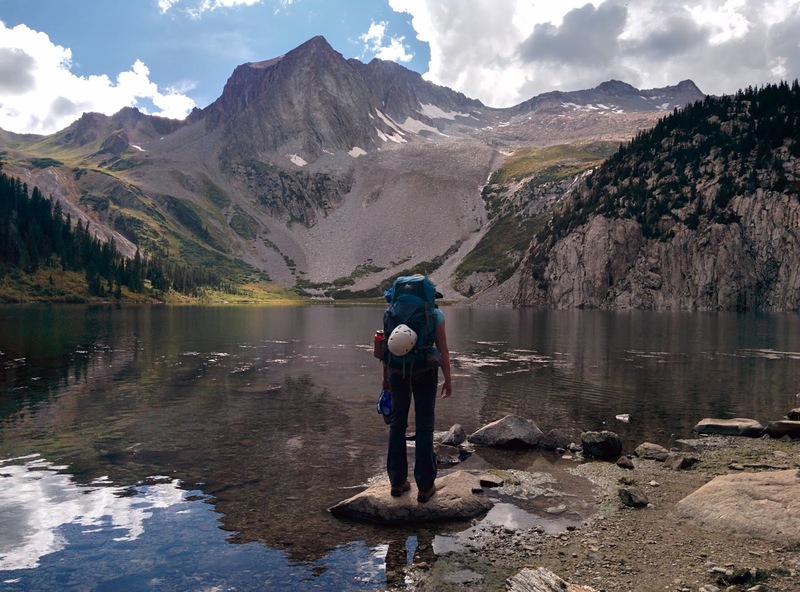 It's not just a thoroughfare to one of the most beautiful alpine lakes ever; the corridor connects hikers to an extensive network of trails and mountains. 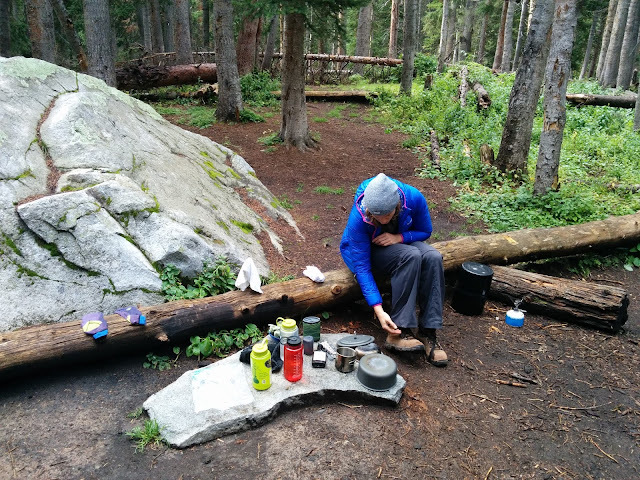 As a result, observing Leave No Trace principles is paramount. After arriving at the trailhead, our first task was to fill out a mandatory (free) wilderness use permit and pick up WAG bags provided by the Forest Service. Doing your business in a bag and carrying it out is always an experience! The trails aren't blazed like I'm used to on the east coast, but clearly easy to follow. Aren't the aspens amazing? I strapped on my Gregory Deva 60 pack and we were off just before noon. The trail starts with a gentle climb along the boundary of a private ranch. Hikers pass through three gates, each more primitive than the one prior, and cross through private land until the 1.75 mile mark. We had to pause while cows crossed our path and dodged some of the biggest cow pies I've ever seen. We also passed the intersection with the West Snowmass Trail a little over a mile in, and I made a mental note not to take a wrong turn on the hike out. 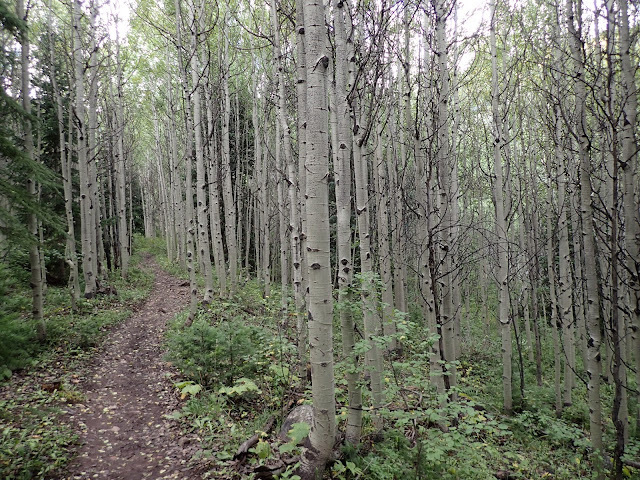 After passing by the ranch and a handful of big, open meadows, we climbed through thick aspen, spruce, and cottonwood stands that reminded me more of the woods in the northeast than the desert I'd imagined Colorado to be. Nearing Bear Creek around four miles into the hike, we caught a glimpse of Capitol Peak (14,130'), listened to Bear Creek Falls from a distance, and imagined what hiking up to Pierre Lakes would be like. The trail took us out of the woods and along exposed rocky areas, talus slopes, and some of the most incredible views I've seen. Somewhere beyond Bear Creek, taking in the view. Stunning, isn't it? Just under six miles in, an expansive alpine meadow dotted with ponds and a beaver lodge came into view along with an obstacle I'd read about in numerous trip reports - the log jam. Hikers can either ford Snowmass Creek or take their chances hopping giant logs that collect at the bottom of one of the ponds. We descended to the log jam and successfully navigated the long moving, creaking "bridge" across the creek. "There is possibly no other creature who individually affects his environment so drastically," my partner mused as the beaver lodge dropped out of sight, "aside from us." After the log jam, the trail flattens and traverses the meadow, passing more ponds, before the last climb. We'd hiked nearly seven miles at that point and I'd hardly felt any negative effects from the altitude, aside from how hard I was breathing exerting any amount of effort. But the additional 1,000 feet we had to gain over the last 1.5 miles of the trip were by far the hardest part. The trail steepens, turns upward, and hikers navigate two long switchback up through deep woods with the occasional opening in the trees to the meadow and ponds below. Views of the meadows under towering red walls typical of the Maroon Bells Snowmass Wilderness helped take my mind off my tired legs. Navigating the log jam. I almost wished we'd brought hiking poles, but we took our time and it worked out just fine! That's when the real fun started. Eight miles into the hike with half a mile to go, we reached a junction I'd been waiting to see - the spur trail to Snowmass Lake. Suddenly, I felt something flopping around on my left foot, peered down, and saw the sole of one of my ten year old backpacking boots was peeling off from front to back. 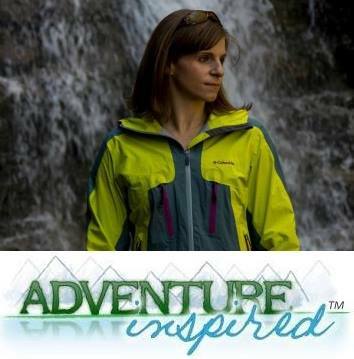 I couldn't believe it, but given I took the boots on trails in Alaska, Virginia, Ontario, the Adirondacks, the Catskills, and more since 2005, it wasn't out of the realm of possibility. I planned on retiring the boots this year, but didn't expect them to fall apart mid-trip. We'd made it almost all the way to the lake with plans to climb another 4,000 feet to the summit of Snowmass Mountain the next morning, and my boots were falling apart piece by piece. Our first look it the lake left me speechless. Between Snowmass Peak on the Left and the little bump in the distance on the right that is Snowmass Mountain, I couldn't handle the beauty. I used webbing to try and tie the sole tightly enough to keep hiking, and it was sufficient to get us to camp. When we arrived at the end of the spur trail, I stopped, completely in awe. Snowmass Lake is beautiful beyond comprehension. It's massive, deep, bright blue when the sun is just right, and sits at the base of a stunning 14,000-foot peak. It was perfect. We snagged one of many big, beautiful established lakeside campsites, (more than 100 feet from the shore, of course), unpacked, and inhaled Mountain House Italian Pepper Steak. As the sun set, we chased gray jays away from our leftovers and discussed adjusting plans now that I only had one working boot. Performing surgery on my left boot and examining the right in our "kitchen" at camp. In the second installment, coming soon, I'll share what we ended up doing with the next two days, and given what the first day of the trip brought, you can bet it's going to be interesting!